Turkmenbashi is dead! Long live Turkmenbashi? I haven’t read a book like this for many years. "What is undeniably true is that all today’s reforms and achievements are a credit to the particular managerial and organizational abilities of the man who initiated the current stage of development and the transformation of the country. Gurbanguly Berdymukhamedov is truly the Son of the Turkmen People". The book called The grandson fulfills his grandfather’s dream was published by the Turkmenistan state publishing house in 2010 with a print run of 10,500. It consists of 22 articles by Tachmamed Djurdekov, written during the period October 2007-November 2009, an introduction and a conclusion. 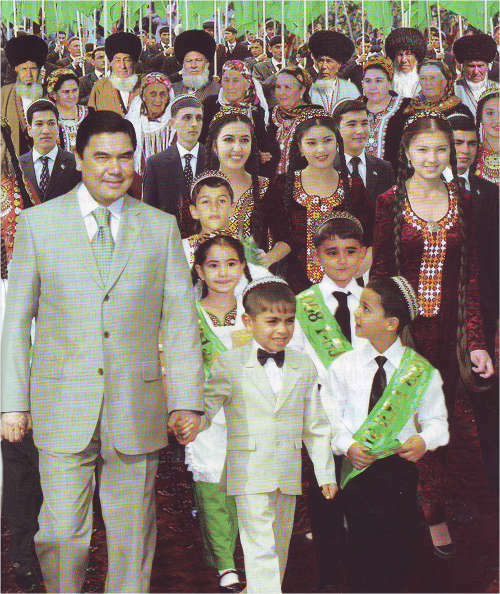 All the articles are dedicated to Turkmenistan’s brightest son, the leader of the Turkmen Renaissance, a great man, who bears responsibility for the fate of his people – the Turkmen President Gurbanguly Berdymukhamedov. "Turkmen history goes back 5000 years. Reading has always been popular. Everyone knows this and now it is obvious to the whole world”, writes Djurdekov. Well, now I know what kind of a book this is. I’m reading it. "The fortune of our President is the fortune of our republic and people… It is impossible to separate them… The generations are proud of their President and vice versa" (from the book). In times gone by Ruhnama was the book that was loved by all Turkmen. The new book says not a word about Ruhnama or Saparmurat Turkmenbashi the Great. It’s as if they never existed. 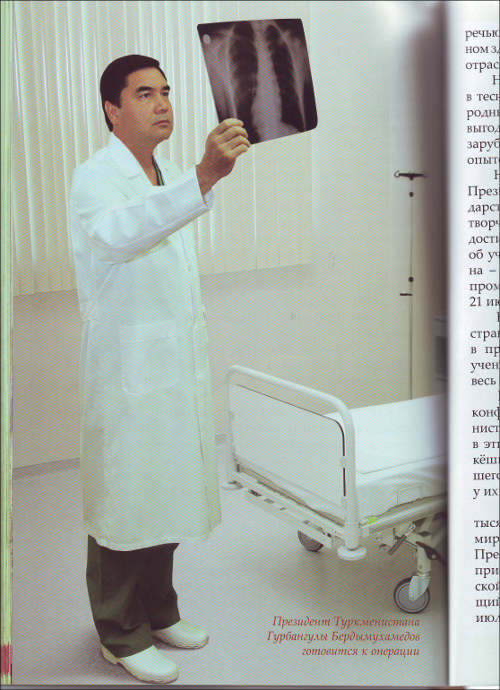 Everything that happens in Turkmenistan is dictated by Berdymukhamedov, who is fulfilling his grandfather’s dream, rather than by some Niyazov [Turkmenbashi or Leader of the Turkmen ed] or other, who doesn’t even merit a mention: "Thank God the head of state now is the Grandson, who is fulfilling his grandfather’s dream. No problem is too much for him". Everything, including Turkmenistan’s international neutrality, is attributed to President Berdymukhamedov. "The Turkmen people, chosen by God and with 5000 years of history, recently elected Gurbanguly Berdymukhamedov President. They made the right choice. Turkmenistan is a haven of stability, prosperity, unity and peace on the planet. Our revered President Gurbanguly Berdymukhamedov, the Son of his People and our noble leader has in a very short time achieved world recognition, and his authority and considerable popularity come from God". 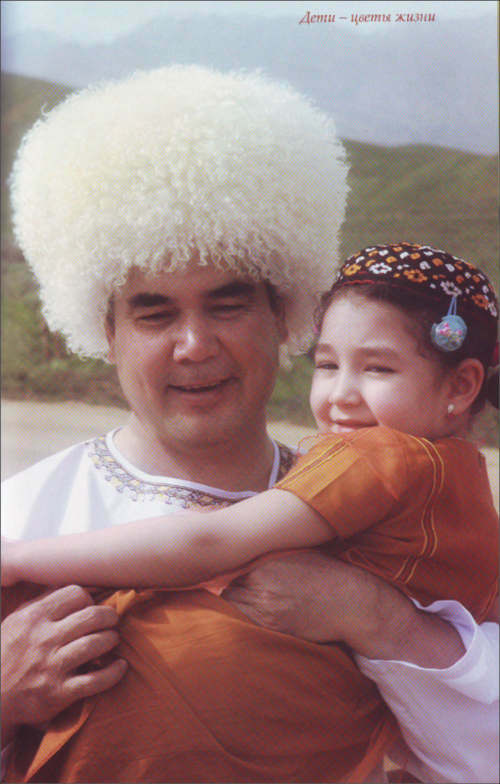 None of the Niyazov initiatives, whether taken up or cancelled by Berdymukhamedov, is attributed to the Turkmenbashi. In the article on the circus, for instance (the circus was banned by Niyazov and reopened by Berdymukhamedov), there is a passing reference only to: "..the outstanding efforts of our wise President who has revived the circus culture after years of non-existence". The reader has no need to know the explanation of the years of non-existence. The implication is that the problems of the Turkmen circus culture stem from Soviet power, which slaughtered horses for sausage meat. Now Turkmen horses are also enjoying a Renaissance. According to the book, the Renaissance referred to is not recovery from Niyazov’s rule, as the international community had understood, but from Soviet rule. Djurdekov does not specify what happened during the 15 years of independence since 1991. His is the professional amnesia of the flatterer. Sometimes Tachmamed Djurekov lets slip facts of his own biography. In 1964 he graduated from the library department of the Moscow State Institute of Culture and worked in the Karl Marx State Library of Turkmenistan (now the National Library). Djurdekov also worked in the Cultural Affairs Dept of the Turkmenistan Communist Party Central Committee. 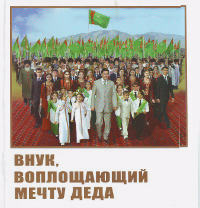 Excessive adoration of the leadership was never a sin in Turkmenistan, but written declarations of devotion only became popular after independence. So what was his grandfather’s dream all about? He was a teacher and loved reading. His son worked in a secondary school from time to time (when he wasn’t working in the Ministry of the Interior) and loved reading. His son’s wife loved reading. She even “read law books, so she had an educated view of the world». The grandson-president, no doubt, also loves reading and wants all Turkmen to study hard. “In childhood he read many books, thought and dreamt about them for many years”. This is another author writing about another national leader. But it’s the same idea. Every page of the book runs with treacle. "The president of our country is not only a doctor, who treats the sick, but a great man, taking full responsibility for the fate of his people and, most importantly, for public health. Everyone is struck by this unique combination". "When I was reading the photocopy of the Decree, I was so emotional that I caught my breath”. For Djurdekov the president is god, tsar and unattainable ideal, whose footprints he is ready to kiss. Any word, banality or truism pronounced by Berdymukhamedov throws Djurdekov into a frenzy of rapture. "He [the president ed] says about literature: ‘…I believe that fiction is significant not only for the health of individuals, but for the healthy development of the whole of society’. Literature, books, public health! What harmony and integrity!" enthuses Djurdekov. Such open flattery and admiration for a ruler is to be found only in jokes - and in the writings of Djurdekov. “I can confidently state one truth”, he says, but this is too modest. Throughout the book he confidently states one truth after another. About reading, for instance. "Reading never made anyone disappointed or sad. Books enrich man’s inner life. Anyone who has made books his constant companion is happy". Or he writes about the President’s mother: "Today this warm-hearted woman has become the sacred mother of all Turkmens. To bow down before her is a sign of respect for sanctity”. Little Gurbanguly loved reading and this was true of him as a student too. If he didn’t manage to finish a book, he was so upset it put him off his food. "Despite having to leave home early in the morning, he did not feel particularly tired. He would spend 8 hours a day in the university, listening and writing down everything his learned teachers taught him. The great leader and teacher completed his studies and now, "by the will of God", is head of state. "Berdymukhamed aga [grandfather ed] could have had no idea that his grandson would become president and shape his actions to accord with the interests of the whole of humanity”. The book was published in three languages: Turkmen, Russian and English. Allegedly, there are also copies in German and Chinese, but this has not been verified. However, there is nothing to prevent the Germans and the Chinese from publishing this wonderful book and the ensuing preferential treatment will not be long in coming. The grandson fulfilling the grandfather’s dream could serve as a required text for a course on “Literature in the era of the personality cult”. With the publication of this book we can forget about Berdymukhmamedov’s pre-election promises and our illusions and hopes for liberalization in Turkmenistan. The cult of personality and oriental despotism has been established in Turkmenistan. The editor of the book is Victor Khramov, the deputy head of the Presidential Administration, "the mastermind" and ideologue of the cult of Niyazov. The same tools are being used to construct the personality cult of Berdymukhamedov. Ferghana.Ru sources report that the book about the Grandson will be studied in schools and university, just as Ruhnama was. "The successes of our country under our revered President are attracting world attention to our country", writes Djurdekov. This is true. Medecins sans Frontieres has already published a damning report on healthcare in Turkmenistan and the UN has started to look into the question of secret jails there. The world community would do well to take a closer look to Ashkhabad and to sympathise with people compelled to live under the thumb of the "chief defender of the tree of independence".